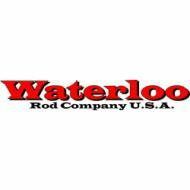 Waterloo has been designing and building custom rods for over a decade. When fishing is not just a sport, but a way of life, you want a rod that always performs and never lets you down. Choose Waterloo. This rod is the little brother of the original HP Series. When light lines, small spoons, top waters, and touts are part of your arsenal, it is THE ultra-light for sight fishing the flats. Casting or Spinning in proven lengths of 6’7”, or 7’0”. Lure weight is 1/8 – ½ oz and Line weight it 6-12 lb. This rod is designed to effortlessly cast and retrieve light plastics or work top waters or Corkies. So if “Super Spook”, “Top Dog”, or “Corkies” are in your vocabulary, and you are searching for that one fish of a lifetime, this is your rod. REC Recoil Solid TItanium Guides Standard. Your choice of straight, bubble, or split grip design. Available in proven lengths of 6’6” and 6’9”. Lure weight is 1/4 – 3/4 oz and Line weight is 8 – 14 lb. The Flagship of the Waterloo line up. Performance that is worth the price. This light, sensitive, and highly efficient rod is the top of the line. Designed for casting anything from plastic baits to spoons and top waters. REC Recoil Solid TItanium Guides Standard. Your choice of straight, bubble, or split grip design. Casting and Spinning Models in 6’6”, 6’9”, 7’0” and 7’6”. Lure weight is 1/4 – 3/4 oz and Line weight is 8 – 14 lb.